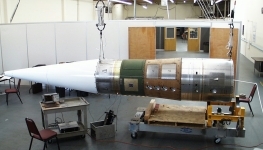 The Space Vector air bearing facility is used to to test post boost attitude control systems in a space-like environment. This is a complete hardware-in-the-loop (HWIL) test running the flight software. TM data and laser pointer traces are used to verify system performance. Space Vector has developed a variety of ruggedized test consoles using proven data acquisition and analysis software together with data acquisition cards. The test consoles are centered around a COTS computer. Standard models are designed into a two to three stack 19-inch rack anti-vibration transit cases with optional printer. One of our key pieces of test equipment is the Telemetry Ground Station. 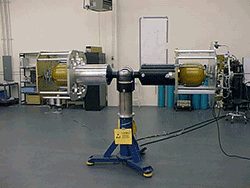 This system can receive up to 5 S-Band PCM links (2200 to 2400 MHz) simultaneously. Each link has a 10 Mbit/sec data width and outputs can be configured as NRZL, NRZM, NRZS, and 422 data. The system uses dual processors operating at 450 MHz. Data is stored directly to an 18 GB hard drive for processing. 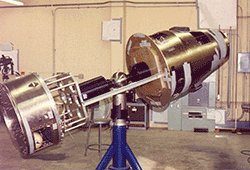 Space Vector owns two GPS constellation simulators: A Spirent GSS7700 and a dual output GSS8000. These simulators are used for testing our GPS tracking units under flight representative scenarios. Space Vector owns four large thermal chambers and has access to additional capacity.